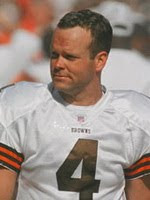 Observers of sports the world over ask: "Is there nothing that Phil Dawson cannot do?" Steve King profiles the rocket-armed passer with the lifetime QB rating of 108. 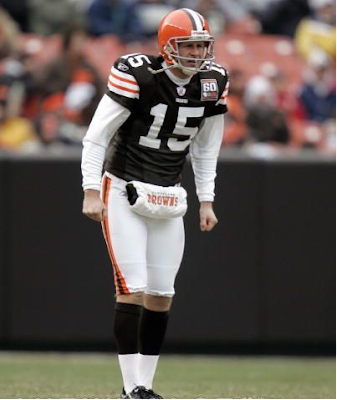 Phil Dawson may not only be the best kicker in Browns history. He could also retire someday as one of the highest-rated passers in club annals. Much to the disbelief of his two sons, Dru, 8½, and Beau, 6½. “When I play catch with them in the back yard, they always tell me I don’t throw good passes that they can catch,” Dawson said before practice on Wednesday as the Browns began getting ready to meet the Cincinnati Bengals on Sunday at Paul Brown Stadium. Dawson, the last member of the 1999 expansion Browns still playing anywhere in the NFL, threw the first pass of his 11-year career last Sunday when, on the “sleeper” play, he took a direct snap from Ryan Pontbriand on a fake field-goal attempt and fired a 10-yard strike to the right to wide receiver Mike Furrey, who had sauntered in off the sideline pretty much unnoticed. The play, which started with just 13 seconds left, came on fourth-and-9 from the Detroit 21. It almost worked for a TD. Safety Louis Delmas realized at the last moment that Furrey, a former Lion, was out there and sprinted out to him to make the touchdown-saving tackle at the 11. On the next play, Dawson, a right-footed kicker but a left-handed thrower, settled for a real field-goal try, which he hit from 29 yards, to give the Browns a 27-24 halftime lead. They eventually lost 38-37. The pass gives Dawson a career passing rating of 108.3. Punter Brian Hansen, who completed an 11-yard pass for a TD to wide receiver Webster Slaughter on the exact play – but on a fake punt – in 1991 at Washington, has a 152.1 rating. The Browns lost that game, too, 42-17. Throwing the football runs in the Dawson family. His father was a quarterback at Baylor. Dawson estimated that he threw three or four times while serving as a kicker at Texas. He also kicked and was a defensive tackle at Lake Highlands High School in Dallas, but never had the occasion to try a pass. On Sunday, the play was set up perfectly. For the longest time, the Lions had no idea what was going on. But, as the officials did all day as the Browns ran the no-huddle offense, they held the ball before spotting it so as to give the Lions a chance to line up. That gave Delmas the time to spot Furrey, but no other Lion did. Dawson’s pass was a laser-shot and right on target. In truthfulness, it was thrown better than some of the passes made this year by Browns quarterbacks Brady Quinn and Derek Anderson. “What I really liked, too, is that my boys were at that game. They saw me make that throw,” Dawson said. So they know their dad can thread the needle, but they probably wonder why, oh why, he doesn’t do it when they’re playing catch with him in the back yard. In other late-afternoon note from Wednesday, the Browns were awarded linebacker Matt Roth off waivers from the Miami Dolphins. He takes the roster spot of linebacker Josh Stamer, who was released on Tuesday. Originally a second-round choice of the Dolphins, at No. 46 overall, in the 2005 NFL Draft, the fifth-year pro had 23 career starts with 158 tackles, 12.5 sacks, five passes defensed and six forced fumbles. The 27-year-old had a big 2008. After moving from defensive end to linebacker, the 6-foot-4, 275-pounder started 14 of 16 games and registered career-highs with 53 tackles, five sacks and four passes defensed. He also forced two fumbles. Roth was a four-year letterman at Iowa, where he was teammates with Browns guard Eric Steinbach for his first two seasons. Kirk Ferentz is a father figure to his Iowa football players, and they credit him with fostering a winning bond. 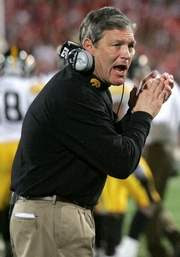 On Monday, Ferentz was named Big Ten Conference coach of the year, marking the third time he has won the award. As part of the contract extension Ferentz signed this year, he will receive a bonus of $25,000 for being named conference coach of the year. 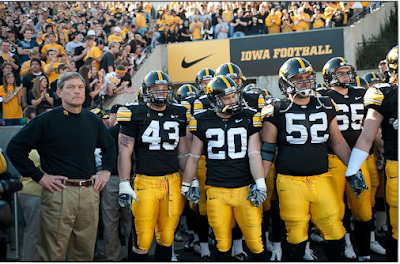 Ferentz, the state’s highest-paid employee, earned about $2.9 million in 2008. Angerer, who recorded a team-best 135 tackles, was among seven Iowa players to earn first-team recognition from either the coaches or the media. The Hawkeyes (10-2) tied with Penn State for second place in the league, and remain in the hunt for a possible Bowl Championship Series bid. It is Ferentz’s fourth 10-win season since taking over the program in 1999. He also was the Big Ten’s coach of the year in 2002 and ’04. Ferentz is the fourth person to be named Big Ten coach of the year at least three times. The others were Michigan’s Bo Schembechler, Penn State’s Joe Paterno and Iowa’s Hayden Fry. “Even to be in that category in any fashion is very humbling,” Ferentz said. Bryan Bulaga, a junior, was named offensive lineman of the year. Joining him on the media’s first team were senior offensive lineman Dace Richardson, senior tight end Moeaki, junior defensive end Adrian Clayborn, senior linebacker Angerer and sophomore safety Tyler Sash. All six of those players were named to the coaches’ first team. Junior cornerback Amari Spievey was the seventh Hawkeye selected by the coaches. Iowa thrived despite a series of injuries that led to 20 different players starting on offense. The Hawkeyes won their first nine games for the first time in school history and challenged for the conference championship, losing on Nov. 14 at first-place Ohio State in overtime. Iowa’s defense ranked 10th nationally, allowing 286.7 yards per game. Adrian Clayborn tied for second in the Big Ten with 9.5 sacks. Angerer was more critical of his performance, even though he is one of five finalists for the Bronko Nagurski Trophy, given annually to the nation’s top defensive player. Iowa’s second-team picks were senior linebacker A.J. Edds, senior offensive lineman Rafael Eubanks, junior receiver Derrell Johnson-Koulianos, senior offensive lineman Kyle Calloway and junior safety Brett Greenwood. Moeaki was a second-team media selection. While he admits he made some mistakes, Colts tight end Tom Santi made the most of his time on the field in Sunday's win over the Ravens. BALTIMORE -- The Colts pride themselves on plugging people into holes with no drop-off. They expect that when mistakes are made, they will find a way to overcome them. Sunday at M&T Bank Stadium, as they improved to 10-0 with a 17-15 win over the Ravens, second-year tight end Tom Santi came to symbolize both themes. The Colts were without Gijon Robinson, a starter who does a lot of blocking in the shadow of Dallas Clark, helping keep Peyton Manning clean and create room for Joseph Addai and Donald Brown. While he was in Indianapolis recovering from a concussion, Santi got the call. Santi proved himself a capable blocker and a largely reliable target for Manning, chipping in with six catches for 80 yards. He also had three costly plays -- a lost fumble near the goal line, an apparent alligator-arms moment in another scoring chance and a false start penalty. The Colts don’t so much plan to feature a guy as they allow Manning to take what’s available. Robinson isn’t generally a large piece of the passing offense. Santi had a sense in the middle of the week that he’d be in line for a good share of the work that usually goes to Robinson. Clark made a spectacular one-handed catch in the back of the end zone for a 3-yard touchdown to cap the game’s opening drive. Other than that, Baltimore did things defensively that prompted Manning to look elsewhere, and he turned to Santi for four of his 12 first-half completions. “We saw some things, and obviously the quarterback is pretty good back there and he does a great job putting us in great position,” Santi said. Down 9-7 in the second quarter, Manning placed a pass to Santi over the middle and in the middle of a crowd for a 22-yard gain. Santi got nailed, suffering a neck injury that briefly forced him from the game. It was a key play on a touchdown drive that put Indianapolis ahead 14-9. On a day when he made his first catch of the season, he might have also scored his first touchdown of the year. Instead, he ended the Colts’ first possession after the half when he was clobbered at the 1-yard line, hit low by Ed Reed and then high by Ray Lewis, who jarred the ball free for Dwan Edwards to recover. Just about anyone might have coughed it up when scrunched by two eventual Hall of Famers. Santi didn’t know who the defenders were. "That’s a bad play on my part," he said. "I definitely left points out there. As far as I am concerned, that’s unacceptable." The Colts' defense didn’t allow it to translate into points. While Baltimore moved 84 yards on the ensuing possession, Billy Cundiff missed a 30-yard field goal wide right. Later, with Dawan Landry closing fast, Santi seemed tentative on a ball he could have pursued more aggressively on a second-and-goal from the 7. Just before the 2-minute warning, he was whistled for a false start. He said both errors were a matter of lost focus. On the pass, he needs to come out of the break faster and be ready for it quicker. He will enjoy the win, review the film, then shred it, mentally, as he knows his coaches will. Then, if still needed, he will plug back in to the next-man-up, play-the-next-play philosophies that are a big part of why the Colts are the AFC’s lone undefeated club. He’ll simply look to be the kind of player Wayne says all of the Colts are supposed to be. With both Virginia head coach Al Groh and Maryland head coach Ralph Friedgen having come under fire recently for their team’s performances, I thought I would share my personal experiences with our three local ACC coaches and show that coaches aren’t always what they seem. Al Groh is an interesting man. To be honest, when I first met him, I was intimidated. He’s extremely intelligent and can sometimes come across as stand-offish. From what I saw, he rarely smiled, didn’t crack jokes and didn’t hesitate to correct someone. But my impressions of Al changed in January of 2007. I was covering a Virginia men’s basketball game in Charlottesville. My mom had just passed away from ovarian cancer the week before. I missed the 2006 football season because I was home taking care of her. So while I was in Charlottesville, I decided to stop by the McCue Center and say hello to Al. I only meant to pop my head in and say a quick hi, but I ended up spending almost 30 minutes in his office talking about the last few months and losing my mom (yes, I got emotional). He was unbelievably supportive and offered me many encouraging words. I will never forget that conversation with Al. Since then, I have seen a different side of Al Groh and so have you if you watch our weekly Al Groh reports on the website or SportsNite. A few weeks back, we asked him about his players nicknaming him “Jeezy”, as in the rapper “Young Jeezy.” Say what you want about Al Groh, but there’s a reason why those close to him, including current and former players, are fiercely loyal to him. There is another side and I consider myself lucky to have seen it. Frank Beamer is one of the most genuine people you will ever meet. 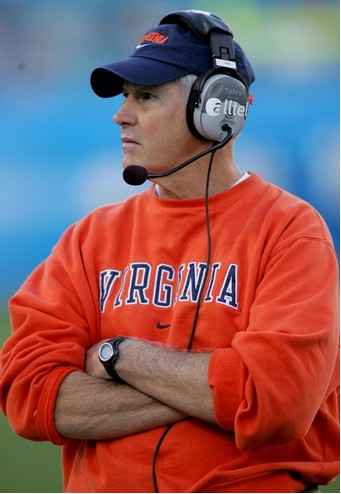 There is no “other side” to the Virginia Tech head coach. There are not many coaches in the country like that so it’s no wonder his assistant coaches have been with him for decades. I returned to Lake Oconee in 2006 for another work assignment. My coaches features for that year were “Coaches and Their Kids.” I went down there along with videographer Dave Letourneau to interview both the Beamers and the Friedgens. After ribbing me for wearing a red CSN shirt (they didn’t make Chicago Maroon at the time), the Beamers welcomed us into their home with open arms. Frank’s son, Shane, had just returned from his honeymoon with his lovely bride Emily. At the time he was an assistant coach at Mississippi State. 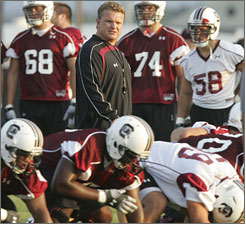 He’s now the special teams coordinator and recruiting coordinator at South Carolina. Frank’s daughter, Casey, works for the Carolina Panthers. We had a wonderful visit that included a boat ride with the family. I continue to stay in touch with the Beamers quite a bit. Every time I see Frank’s wife, Cheryl, I always get to see new pictures of their granddaughter, Sutton. Not that it’s ever hard to see Frank Beamer smile, but just mention his grandbaby and the head coach’s face lights up like a Christmas tree. So think what you want about these head coaches, but just remember, there’s always another side. One thing to keep in mind was the Browns were without their second best player: Dave Zastudil. Or they might've surprised the Ravens by punting on third down. Miami coach Randy Shannon talks via his headset during the second quarter of an NCAA college football game against Florida State, Monday, Sept. 7, 2009, in Tallahassee, Fla.
Somewhere in between Florida's drive for a third national title in four seasons and FSU's shocking slide into irrelevance is a college football story that's not getting enough play in this state. I'm not saying that Miami's 7-2 revival has gone completely unnoticed, but there just aren't enough people who fully appreciate its worth. Blame it on the lingering haughtiness of another Hurricane era, the notion that no season is memorable or even particularly remarkable unless it ends in a national championship. 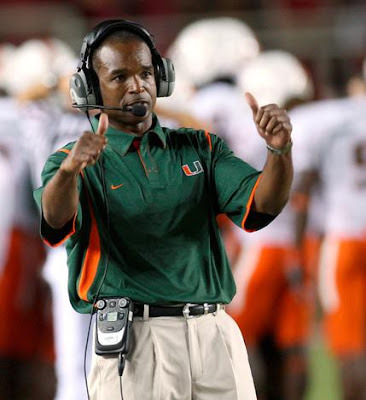 Randy Shannon bears some responsibility, too, for yanking the emergency brake any time fans and media start getting ahead of the game on expectations. He wants his guys to earn everything they get, as clearly indicated by Miami's season-long pattern of 5:45 a.m. Wednesday practice sessions. There's no denying, however, that Miami has become one of the best jobs in America again. Shannon has made it so by doing all the heavy lifting required after Larry Coker's firing. Randy recruited South Florida hard and well, working the Miami neighborhoods where he grew up, and he endured the frustrations of a 5-7 record in his first season as head coach. 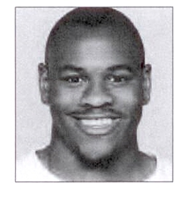 Nothing could have been more jarring to the sensibilities of a man who won one national title as a Hurricanes linebacker and two more as a Hurricanes assistant coach. Stubbornly, though, he toughed it out, and last year's 7-6 record, too, even as Butch Davis, Shannon's old boss at Miami, returned to the college game from the NFL and started kicking the Hurricanes around, too. Well, Butch is back on the schedule Saturday as Miami travels to North Carolina. There's no guarantee that the Hurricanes will win the game but, either way, this much is certain. Davis would be much better off at Miami than where he's working today, and that statement is going to become more obvious next season, and the season after that. Shannon's team stands at No. 14 in the BCS standings and is positioned, with young leaders like Jacory Harris and Travis Benjamin and Sean Spence, to rejoin the nation's elite in 2010. Davis, on the other hand, has a 2-3 record in the ACC. He's coaching at a basketball school. He's remembering, too, what he left behind at Miami for the sudden money and swift disillusionment of the Cleveland Browns. Butch got the Hurricanes all the way to No. 2 in the final AP poll of 2000. His last game was a 37-20 Sugar Bowl thumping of Steve Spurrier's Gators. His roster, inherited by Coker and led by Ken Dorsey, produced a 12-0 record and a national title in 2001. While at Miami, Davis coached or recruited stars like Ray Lewis, Edgerrin James, Santana Moss, Reggie Wayne, Jeremy Shockey, Willis McGahee, Sean Taylor and Vince Wilfork. This is a partial list, of course, but Butch could recruit at North Carolina for a lifetime and never approach its quality. Coker is the head coach of a new program at the University of Texas-San Antonio that is tentatively scheduled to begin play in 2011. He started out better than Shannon at Miami but ended up worse. Then there's Dennis Erickson, who won two national titles at Miami. Shannon's got a better job today that he does, too, for Erickson is headed for his second consecutive losing season at Arizona State. Any way you slice it, Shannon and Miami are farther along the road to consistent major bowl contention than the vast majority of Div. I programs. Short view? Miami's probably not going to make the ACC title game this year, but Georgia Tech, the team that's close to locking up the Coastal Division, is No. 7 in the BCS rankings and would be even higher without a 33-17 loss to the Hurricanes. If we don't start learning to appreciate that, then a 10-2 and an at-large BCS bowl bid probably won't be given the proper value in this market, either. Shannon's got to work with that, too, and, thankfully, he seems to be up to it, just like he's been up to everything else at a job that for a time was pretty rough but is close to being regal again. 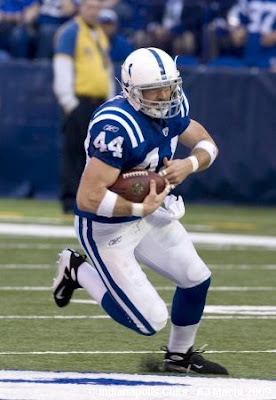 From Jarrett Bell's "First-half All-Pro team: No Manning, no Brady, no Favre"
Colts TE Dallas Clark, who at one time played linebacker at Iowa, outran the Dolphins' defense -- including linebacker Akin Ayodele (51) -- en route to an 80-yard touchdown in September. 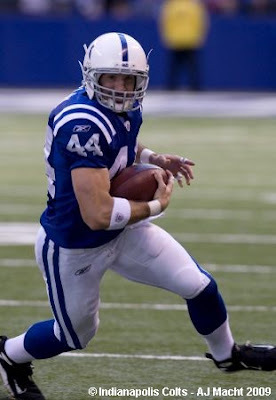 INDIANAPOLIS -- The high-pitched shriek rattled Dallas Clark and sent him racing through that small white house in Livermore, Iowa. He was only 18 then, a bright-eyed high school senior just three days away from graduation and a long way from NFL stardom. But when Clark burst into his garage back in 1998, he saw how fast he was about to grow up: His 49-year-old mother, Jan, had stopped breathing. She had collapsed while cleaning up for Dallas' upcoming celebration. Clark instantly spun back toward the house. He charged inside to call 911, then returned moments later to try resuscitating his mother with the help of his aunt, Judy Jacobson. Paramedics would tell Clark later that Jan wouldn't have survived the heart attack even if she'd been transported to the hospital located 10 miles away. To this day, Clark figures that's what medical technicians tell teenagers who have just watched their mothers die in their arms. 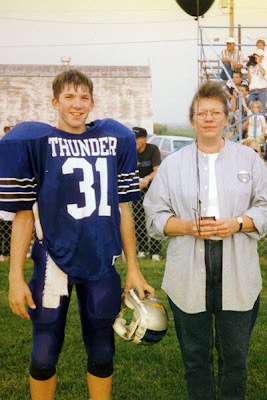 Dallas Clark, seen here as a youngster with his mother Jan: "I keep thinking it would be nice for her to see me doing these things." That's the first thing to understand about Clark -- the pain of that moment will never pass. It was right there in his face a few weeks ago, as he leaned against a wall at the Indianapolis Colts' training facility. Clark choked back tears as he recounted the memories, fully aware that his path to becoming one of the league's best tight ends began when Jan died. "I keep thinking it would be nice for her to see me doing these things," Clark said. "She didn't get to see my first game in the league. She didn't get to see my first touchdown. My wife [Karen] and I have a 7-month-old son [Dane] and she never got to see him. You think it's going to get easier, but it really never does." If Jan Clark were alive, she would be delighted by how far her youngest son has come. Clark has been a key component of the Colts' 8-0 start and race to AFC supremacy, a status that will be tested when the 6-2 New England Patriots visit Sunday night. This fall the seven-year veteran has taken his game to new heights. His 60 receptions rank second in the league. Clark's 703 receiving yards put him on pace for his first 1,000-yard season. For a man who's spent most of his career operating in the shadows of more high-profile teammates -- and more heralded tight ends around the league -- this year has been Clark's official coming-out party. His timing couldn't be better, either. The offseason trade that sent Tony Gonzalez from the Kansas City Chiefs to the Atlanta Falcons means the 30-year-old Clark now has a strong shot of making his first appearance on the AFC Pro Bowl roster. There also are so many young tight ends on the rise that it's hard for everybody to receive adequate recognition. That group includes players such as Philadelphia's Brent Celek, Seattle's John Carlson, San Francisco's Vernon Davis and Houston's Owen Daniels (who just recently went on injured reserve with a torn ACL). "There are so many big tight ends who can run that it's easy to overlook someone like Clark," said Kansas City Chiefs strong safety Mike Brown. "He has above-average size and above-average speed, but he's as good as anybody at the position." Clark has been making life harder on opponents with each passing week. He caught seven passes for 183 yards -- including a first-play, 80-yard catch-and-run touchdown -- in a 27-23 victory over the Miami Dolphins on Sept. 21. Clark added another eight receptions for 99 yards in an 18-14 defeat of the San Francisco 49ers on Nov. 2. And in the 20-17 Week 9 victory over the Houston Texans, he delivered again: a career-high 14 receptions for 119 yards. Clark should be just as tough for New England to handle. "He really limits what you do defensively," said Texans defensive coordinator Frank Bush. "You want to cover him with a nickel back, but he's so big that he can push around a smaller defensive back in the run game. And when you try to put a linebacker on him, he can just run by that person. You usually end up playing zone just to deal with him." What makes the 6-foot-3, 252-pound Clark even more dangerous is his versatility. He can line up: 1) on the line of scrimmage next to the offensive tackle; 2) out wide; 3) in the slot; or 4) in the backfield. Clark is so effective running routes from all those spots that the St. Louis Rams recently paid him the ultimate respect in a 42-6 Colts win on Oct. 25 -- they opened the game with five defensive backs. Although Indianapolis had lined up in its base offense to start the contest, the Rams wanted an extra secondary member available to shadow the tight end. Those tactics still haven't been enough to slow Clark's production. After years of watching wide receivers Marvin Harrison and Reggie Wayne serve as the primary threats in the Colts' system, he's heading toward his first 100-catch season. "I really don't know why my numbers are up," Clark said. "I don't know if it's because Marvin isn't here anymore or because we have so many new receivers. I get asked that a lot, but my thing always has been to just show up to work and give it everything I have. If the ball comes my way, I try to make a play." "Dallas has had a great attitude ever since he's been here because he's usually been the third fiddle," said Colts quarterback Peyton Manning. "He was in the game plan but we always featured Marvin and Reggie. "And when Brandon Stokley was here [from 2003 to 2006], Dallas really became the fourth fiddle. But now defenses are giving him a lot of opportunities and we're looking to take advantage of them." 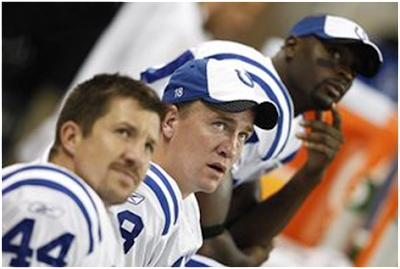 Dallas Clark (44) is a prime target of Peyton Manning's, as is receiver Reggie Wayne (behind Manning here). One reason Clark has never complained about his role is that he really doesn't see the value in whining. As Colts head coach Jim Caldwell said, "You always can find Dallas on the practice field because he's the one having the most fun." The Colts even get a kick out of Clark off the field. When the team traveled to Miami for Super Bowl XLI in February 2007, he was teased for his outfit -- a cream-colored suit with a mock turtleneck that Clark figured would fit in with the South Florida crowd. Said Colts center Jeff Saturday: "Dallas is definitely a bit of a country boy." Clark doesn't mind that label. In fact, he still lives in Livermore, a town of roughly 430 people, during the offseason. Everybody knows his family -- he has two older brothers, Derrik and Dan -- and they always make him feel loved. "I love what you get from being in a small community," Clark said. "When my mother died, everybody pitched in and brought food to help out. You don't forget that stuff. That's why even though I'm here doing my thing, I always feel like I'm representing them. I'm always trying to stay grounded." That's exactly how Clark was raised after Jan divorced Doug Clark during Dallas' childhood. She had two older sons and they learned the value of dependability from her. She never missed any of her sons' games and she always was easy to find. Jan was once so into one of Dallas' childhood basketball games that she literally moved with him down the stands as he dribbled the ball upcourt. "She raised three of the most ornery boys you'd ever find and she was always there for us," Dallas said. "She was everything." Jan's death ultimately rocked the entire town. She had worked as the city clerk and just about everybody knew her. In fact, the Clarks didn't have to think hard about where to have her funeral. In order to accommodate the huge crowd, they held it right there in the gymnasium at Clark's school, Twin River Valley High in Bode, Iowa. Clark easily could have drifted after that point. But that's when everything he'd learned from his mother and his brothers, both of whom played football in college, made an impact. Though Clark was going to be a walk-on linebacker at Iowa later that fall, he wasn't going to give up on himself. As his aunt, Judy Jacobson, said, "You know the saying, 'When a boy becomes a man?' That time was a big step for Dallas." "The best thing about Dallas is that he wants to compete," Dan Clark said. "I think that helped him when our mother died. He always had the mental toughness to keep going. And I really think he didn't want to disappoint Mom." 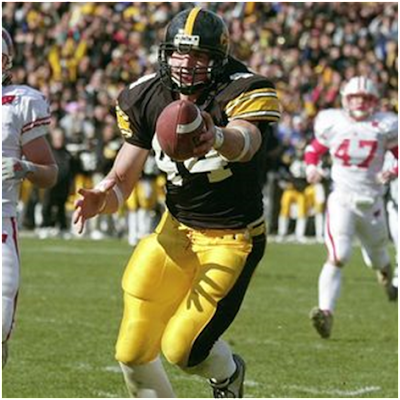 A walk-on at Iowa, Dallas Clark languished at linebacker until a position switch helped him become a star. Clark's road didn't get any easier in college. After breaking his collarbone playing high school baseball, he wasn't even on the Hawkeyes team as a freshman (he was a "gray shirt" because of his injury). He made money by cutting the grass at Kinnick Stadium. His second year was ruined by an appendectomy. Once Clark got on the field during his third year of school -- his redshirt freshman year of eligibility -- his shortcomings as a backup linebacker limited him. He played primarily on special teams. When Dallas asked Derrik to review film of Dallas' defensive skills, Derrik was stunned. "There was no technique," said Derrik, who played linebacker at Iowa State. "In high school, all Dallas had to do was see the ball and run to get it. But in college, he was taking so long to see the ball that he was getting gobbled up by the offensive linemen. That's how slow he was at reading the play." Clark might have remained an unsuccessful linebacker if not for a snowy day in January following his third year at Iowa. When his roommate, then Iowa quarterback Kyle McCann, asked him to play catch in the team's indoor training facility, Hawkeyes head coach Kirk Ferentz just happened to be walking by during their session. What Ferentz saw was the prototype for a pass-catching tight end: a big kid with soft hands, surprising agility and a natural feel for running routes. Though Clark always had wanted to be a linebacker just like Derrik, he was Iowa's starting tight end by the following season. As a tribute to Jan, he wrote "Mom" on the tape wrapped around his wrists during games. "It didn't take long for us to see he could catch the ball and run with it," said Hawkeyes offensive coordinator Ken O'Keefe. "Dallas would catch a 5-yard pass and go 50 yards with it. He once caught a simple dump-off and went 95 yards for a touchdown. He just had a knack for knowing how to finish plays." Clark developed so quickly that he won the John Mackey Award -- given to the nation's top tight end -- as a junior. But he still didn't feel like a star when he passed up his senior year to enter the 2003 NFL draft. After playing a round of golf with his brothers, Clark spent the rest of the day holed up in a hotel room outside of Iowa City with a few family members. Even though he was projected as a top pick, he didn't want any reporters or fans finding him. He'd watched Derrik go undrafted a few years earlier and Dallas feared facing the same fate. When the Colts selected him 24th overall, Clark still didn't savor his success. "I don't even know if I believed I was a first-round pick in my first year," Clark said. "I was totally oblivious to what that meant. Some guys get an ego boost, but I felt like I had to prove myself even more. I didn't want to be one of those guys that the organization is always waiting to develop." Dallas Clark has paid his dues. In 2005, a hit from Denver Broncos safety John Lynch caused Clark to spit blood. Still, there was a steep learning curve for Clark. At Iowa, he often used his natural ability to succeed. 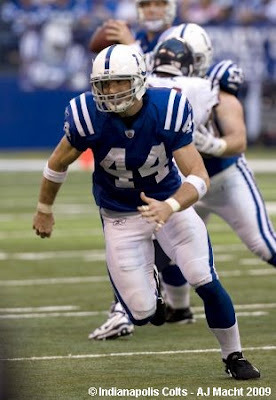 During his first few years in Indianapolis, Clark had to deal with the Colts' complex offense. "I never remember getting a phone call from him where he said he wasn't getting the ball enough," Derrik said. "Instead, he would say things like, 'Do you know how much I screwed up today?' He really had to bust his hump to learn what he was supposed to do." Clark eventually found his way. He averaged 30 receptions through his first four seasons and then his numbers increased as injuries sapped Harrison's effectiveness. 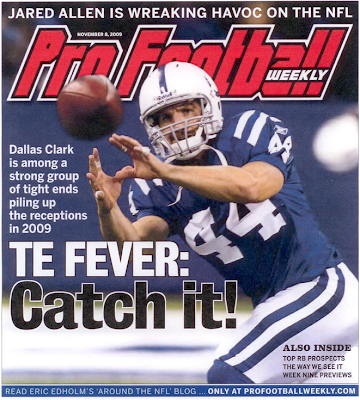 There was a 58-catch season in 2007, a year when Clark said, "I finally started feeling like the offense was coming naturally to me, that I wasn't always thinking about what to do." 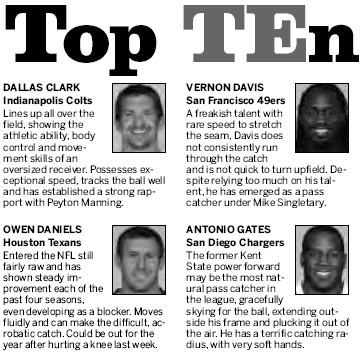 In 2008 Clark improved again -- he caught 77 passes for 848 yards although those numbers still weren't enough to put him in the Pro Bowl (Gonzalez and San Diego Chargers star Antonio Gates were selected, and Daniels was the team's alternate). This year Clark keeps showing how much his chemistry with Manning -- who rooms with Clark on road trips -- is yielding huge benefits for an offense that hasn't changed much schematically. "A lot of Clark's success has to do with him having one of the best quarterbacks ever," said Chiefs defensive back Brown, a 10-year veteran and former Pro Bowl selection with the Chicago Bears. "He knows how to get to the right spot on the field and Peyton knows just where to put the ball so only [Clark] can catch it. They can just look at each other and know exactly what the other one is going to do." That was the case in that victory over the 49ers. After catching just three balls in the first half, Clark caught five in the second, including three that resulted in critical first downs in the fourth quarter. Following the contest, Clark met with a collection of friends and relatives who had made the trip over from Livermore for the game. There was wife Karen with a beaming smile and Derrik wearing his younger brother's college football jersey. Jan's old high school basketball coach had driven over, as well. Of course, there's always one person missing from these special evenings, but Clark realizes his mother would be proud of what he's become. 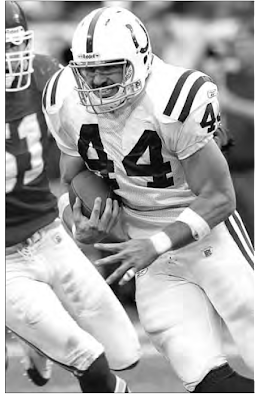 There was a time when Dallas Clark was merely another talented player in the Colts' high-octane offense. Now he's taking his rightful place among the elite tight ends in the NFL. "As hard as it's been, I really do love the road I've traveled to get to this point," Clark said. "It's made me appreciate all the little things that come with this game. I know it's a blessing to be here. And that's why I'm going to make sure I always enjoy it." Behold today's college football assistant coach. He's an executive associate, senior associate, associate or assistant head coach. Or a running or passing game coordinator. Or in one case, a defensive passing game coordinator. The array of fancier, added-responsibility titles — beyond the traditional offensive and defensive coordinators — has reached the point that well more than one in three assistants today are something more than mere position specialists. And in many cases, their contract terms reflect it. South Carolina, for example, limits multiyear contracts to its coordinators but wanted to extend that security to new hires Eric Wolford and Lorenzo Ward this year. Head coach Steve Spurrier runs the offense. Ellis Johnson was the Gamecocks' incumbent defensive coordinator. So in addition to putting Wolford in charge of the offensive line, athletics director Eric Hyman approved his appointment as running game coordinator. Johnson was re-designated as the assistant head coach for defense, freeing Ward to become coordinator as well as safeties coach. Beyond the contract length, "In the minds of assistant coaches, if you've got that coordinator's title, it gives you maybe a quicker timeline to becoming a head coach," Hyman says. "I think that's part of it." He acknowledges, "There has been a proliferation of created titles." Major-college football now counts at least six passing game and 13 running game coordinators. At Colorado, Greg Brown is in his fourth year as secondary coach and his third as the defensive passing game coordinator. Close to 60 top-level assistants have some sort of senior, head-coach's-right-hand-man designation. Alabama, whose nine assistants earn an average of more than $300,000, has two associate and two assistant head coaches in addition to offensive and defensive coordinators. Florida State has executive, associate and assistant head coaches under Bobby Bowden, and they and offensive coordinator Jimbo Fisher— the designated successor to Bowden — average a little more than $399,000. "Up to this point, the coordinator has been the person who got attention after the head coach as someone with experience and authority and perhaps on the next-layer-of-the-onion route to becoming a head coach," says Dutch Baughman, executive director of the Division 1A Athletic Directors Association. "Here's an effort to identify people who are very, very good and title them differently to kind of elevate them from the crowd." He sees little wrong with it, he says. Among other things, Baughman says the moves could better position minority assistants to move into head coaching jobs — a sensitive issue in a sport in which the number of minorities in charge of programs has long lagged. "Perhaps that's another way," he says, "a school can say, 'Look, he's not a coordinator but pay attention to this guy. He's really, really good. And to support him, we're going to give him this title.' 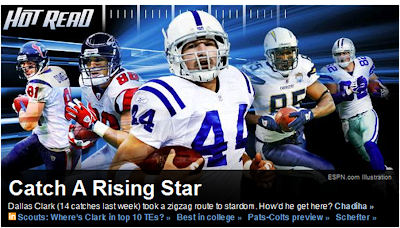 "
INDIANAPOLIS -- Can Colts TE Dallas Clark get a little respect? Maybe a lot of respect? With Tony Gonzalez now in the NFC and Houston's Owen Daniels done for the season with a knee injury, it seems only an injury of his own can keep Clark from finally getting his first Pro Bowl ticket. But the more germane question might be this: Is Clark now the premier player at his position in the NFL? Clark leads all tight ends with 60 catches, 16 more than Dallas' Jason Witten, who is second on the list. Clark tops the group with 703 receiving yards, 113 more than San Diego's Antonio Gates, who ranks second and will probably join Clark on the AFC Pro Bowl roster. Clark's three receptions of 40+ yards illustrate his big-play ability; outside of Daniels (2), no other tight end has more than one catch of at least 40 yards. But Clark also gets the tough, drive-extending yards -- he and Gates pace tight ends with 30 grabs that resulted in first downs. Clark tied Marvin Harrison's franchise record with 14 catches (119 yards) in Sunday's 20-17 win over the AFC South rival Texans. Clark finished one grab shy of tying Witten and Kellen Winslow (the original) for the single-game record for a tight end. Afterward a modest Clark, who found seams in Houston's coverage all day, said: "It was kind of one of those things that you try and take advantage of things that are given us." Clark continues to give the Colts plenty, effectively masking the departure of Harrison and absence of injured No. 2 WR Anthony Gonzalez by continually getting open and giving QB Peyton Manning a go-to option outside of No. 1 WR Reggie Wayne and youngsters Austin Collie and Pierre Garcon. 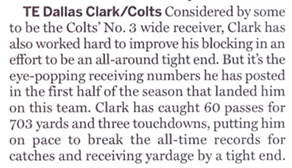 And Clark only seems to be getting better coming off what seemed to be a career year in 2008 (77 catches, 848 yards). "He's been playing well all year," says Colts coach Jim Caldwell. 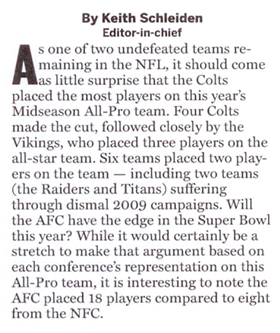 Well enough to finally get that Pro Bowl bid -- unless the currently unbeaten Colts are barred from the All-Star exhibition because they're busy preparing for Super Bowl XLIV on the following Sunday. The tight end that typically gets overlooked for awards finally got one today as the Indianapolis Colts’ Dallas Clark was named NFL AFC Offensive Player of the Week. Clark, a seventh-year pro who has flourished in this offense but has yet to make his first Pro Bowl, tied a franchise record with a career-high 14 catches in Sunday’s 20-17 home victory over Houston. Clark’s catches tied former receiver Marvin Harrison for most in a Colts game. It’s also the third-best single-game total by a tight end in NFL history, behind Kellen Winslow (1984) and Jason Witten (2007), each with 15. The first AFC tight end to win the honor since Denver’s Shannon Sharpe in Week 11 of 2003, Clark is in the midst of a career year that could shatter single-season league records for the position. Clark’s 60 catches lead the AFC and are second overall. His 703 receiving yards rank sixth in the league. “He’s a guy who’s been playing extremely well all year long, as you well know,” Colts coach Jim Caldwell said. 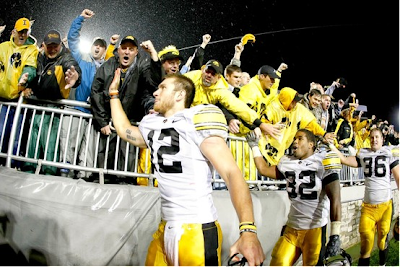 Ricky Stanzi and other players with the Iowa Hawkeyes celebrate a 21-10 victory over Penn State in September. Iowa's upset loss to Northwestern on Saturday didn't fundamentally change the college football season. The unbeaten triumvirate of No. 1 Florida, No. 2 Texas and No. 3 Alabama continues to steam toward the most predictable finish in years. But here's what hasn't been said: Iowa's improbable winning streak, which had reached 13 games and taken them as high as No. 7 in the Associated Press poll and No. 4 in the BCS standings, was one of the most stunning—if not inspiring—stories in the recent history of college football. In a day and age when star coaches at schools in the country's richest recruiting grounds have been hoarding the top talent, the Hawkeyes were an unlikely candidate to threaten them. The team has never won an outright national title, it's only had one marquee recruiting class in the past five years and was ranked No. 22 before this season. Even its coach, Kirk Ferentz, said he was surprised by its performance. "Realistically, I have a hard time even picturing us in the top 10," he said last month. Yet the Hawkeyes started 9-0 this season and beat so many solid opponents that they were ranked No. 1 at one point by the computer polls. Even the loss to Northwestern wasn't an indictment—the Hawkeyes had opened up a lead in the game that collapsed only after junior quarterback Ricky Stanzi was forced out with an ankle injury. What's remarkable about the Iowa program is its relative isolation. The ride to campus in Iowa City cuts through endless farmland. "I mean, a lot of corn on the drive up," says Iowa tight end Tony Moeaki. The lack of population puts the team in a peculiar fix. Other top football schools fill their rosters with scholarship players from their home states—roughly 59% of Florida's recruits the past five years were from Florida, and a whopping 93% of Texas's were from the state, according to Rivals.com. The Hawkeyes have taken only 22% of their recruits over this period from Iowa, which is one of the smaller states to have a major-conference football program. There are four other teams ranked in the top 20 of this week's BCS standings that have lower percentages of native players. Boise State took just 16% of its recruits from Idaho in the past five years, and Oklahoma State took 16% from Oklahoma, while Arizona and Oregon have even lower figures. But each of those schools has an advantage Iowa doesn't: They feed off of bountiful talent from a giant football state nearby—Texas in Oklahoma State's case, and California for the other three. While Iowa is roughly four hours from several Midwestern cities, it faces stiff challenges from competitors like Notre Dame, Nebraska, Wisconsin, Illinois, Michigan and Ohio State. As a result, Iowa's recruiting rankings aren't usually the stuff of champions. After putting together the nation's 11th-best recruiting class in 2005, the Hawkeyes have ranked 40th, 28th, 53rd and 63rd, according to Rivals.com, a Web site that tracks recruiting. "Of course they have trouble recruiting," says former Iowa president Mary Sue Coleman, now the president at Michigan. "They're in the middle of Iowa." Chuck Long, Iowa's star quarterback in the 1980s, said he didn't know anything about the campus before he visited, despite growing up a four-hour drive away, outside of Chicago. "The key to Iowa recruiting is just getting kids to take that first visit," says Mr. Long, who went on to become an assistant coach with the Hawkeyes. "When I was there, we felt like if we could just get someone on campus, we'd have a great success rate of getting them to go to school there. The challenge is getting them to visit." There are those who say Iowa was lucky to get this far. The team beat lower-level Northern Iowa with two blocked field goals, barely squeaked by Arkansas State, beat Michigan State on a last-second touchdown pass and pulled off a big comeback against Indiana after trailing by 10 in the fourth quarter. The season is hardly over for Iowa: The No. 15 Hawkeyes visit No. 10 Ohio State on Saturday in a matchup that will decide which school will receive the Big Ten's automatic BCS berth (which will almost certainly be to the Rose Bowl). The game appears to be a formality. With Mr. Stanzi injured, the Hawkeyes weren't able to score so much as a field goal at home against unranked Northwestern. They don't figure to fare better in Columbus against Ohio State's sixth-ranked defense. In any case, optimism still reigns in Iowa. "We've had a lot of national exposure, so that gets recruits to pay attention," says athletic director Gary Barta. Adds Allen Trieu, a recruiting analyst with Scout.com: "Last week I talked to a number of kids who say Iowa is one of the schools they're excited about." Back in August, we told you about a few coaching interns the Kansas City Chiefs had brought on board to the team's coaching staff. One of those interns, Richie Anderson, has been elevated to a position coach. Another one, Anthony Pleasant, has apparently been working with rookie DE and third overall pick Tyson Jackson. Jackson has been spending extra time with Pleasant before and after practice on different aspects of the life of a 3-4 defensive end. The work is apparently helping as Jackson posted a career best seven tackles against the Jaguars last week. Going into last week, Jackson had two tackles and one assist in the preseason and three tackles and two assists in the regular season. Anderson is a fourteen year veteran who ended his career with the New England Patriots in 2003. He played on the defensive line, both defensive end (in a 3-4) and defensive tackle. He's appeared in 202 games so experience, particularly in the 3-4, is the biggest thing he has going for him. He's certainly for the 'Chiefs Connection' with Scott Pioli (CLE 92-95, BAL 96, NYJ 98-99), Todd Haley (NYJ 98-99), and again Pioli (NE 01-03). 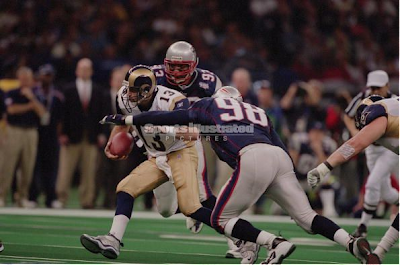 Pleasant was never a Pro Bowler but posted his third best number of sacks in his eleventh year, and first with the Patriots in 2001. Pleasant is (was) 6'5", 280 pounds during his playing career while Jackson is similarly sized at 6'4", 290 pounds. 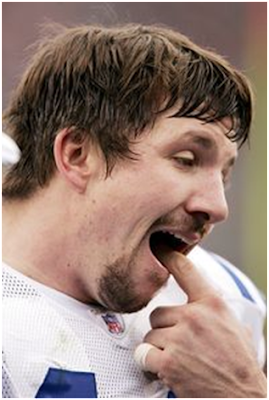 Indianapolis — It’s probably safe to assume that Dallas Clark is going to be one tired tight end this morning. After all, Clark hauled in 14 passes for 119 yards from quarterback Peyton Manning in Sunday’s 20-17 come-from-behind win over the Houston Texans, tying a franchise record. He was Manning’s primary target 16 times — 11 of those catches coming in the fast-break first half — when the Indianapolis Colts went no-huddle for a whopping 50 plays. Clark’s previous high was 12 receptions against the Detroit Lions last season. 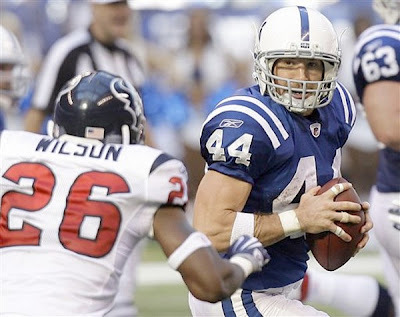 He tied the Colts’ single-game receiving record, which was set twice by former Indianapolis wide receiver Marvin Harrison (at Cleveland, 1999, vs. Dallas, 2002). His 14 receptions tied for the third-most in a game by a tight end in NFL history (Kellen Winslow caught 15 in 1984 and Jason Whitten in 2007). 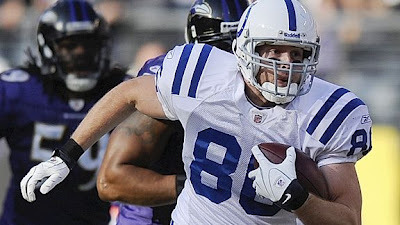 Clark also surpassed Jim Mutscheller for the second-most receiving yards by a Colts tight end. He now has 3,785 and trails John Mackey’s total of 5,126. Clark recorded his seventh career 100-yard receiving game, the second-most among Colts tight ends; Mackey had eight. “I wouldn’t say [the fast pace] was fun. When you run  plays in the first half, you are going to feel that Wednesday and Thursday. [Running the no-huddle] was fun for a series. It was kind of a game-time decision trying to play some up-tempo and mix it up a little bit on them. It helped. I think we were wearing them down, but we were getting pretty tired as well,” the Colts’ 2004 first-round draft pick said after the game. A funny thing happens when opposing teams line up with three defensive linemen in passing situations: None of the rushers ever seem to go up against Stephen Neal. They attack Matt Light at left tackle. They attack Nick Kaczur at right tackle. They attack Dan Koppen in the middle. 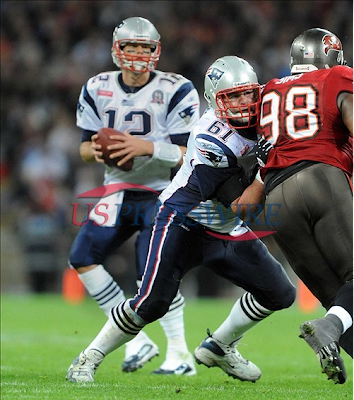 They even sometimes go after Logan Mankins at left guard. But they never seem to go after Neal. And for good reason, apparently: According to ProFootballFocus.com, a site that breaks down each player each week and awards grades on each play, Neal has been the best offensive guard in the NFL so far this season and, according to their point system, the Patriots' most valuable player on offense or defense. "I'm going to have to knock on some wood now," Neal said with a chuckle. "I'm just trying to get out there and practice just as hard as I can and go out there and play as hard as I can. Whatever happens, happens. I can't control it." A look at the film from the Patriots' game against Denver -- according to the crew at PFF, Neal's best game of the season -- reveals that Neal consistently handled defensive tackles and defensive ends one-on-one. When asked to run-block, he consistently steered his assigned defenders away from the play. When asked to pass-block, he did that, too. He even got out on a couple of screens and threw a key block to spring Sammy Morris for a big gain. The Patriots have had a terrific offensive line throughout their run of dominance this decade -- and along with Pro Bowler Matt Light, Neal has been a constant throughout. But this season might be the line's best season yet. Brady has been sacked just eight times through seven games and is on pace for a career-low 18 sacks this season. "Our job is to block for the running back and to not get the quarterback massacred back there," Neal said. "If we're not doing a good job, we're going to hear about it from you guys -- and everybody. We've got to go out there and do our jobs the best we can. I'm not going to catch any touchdowns, so I've got to block."